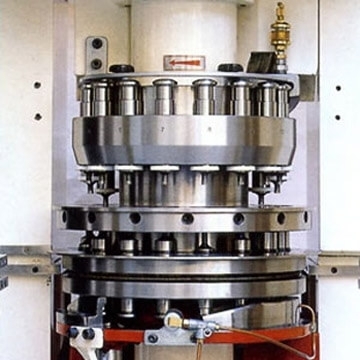 A central lubrication system supplies oil continuously to lower punches, while grease applied manually lubricates upper punches. The ejection cam is manufactured from special tool steel for extended life, while a double sided lifting cam is provided. 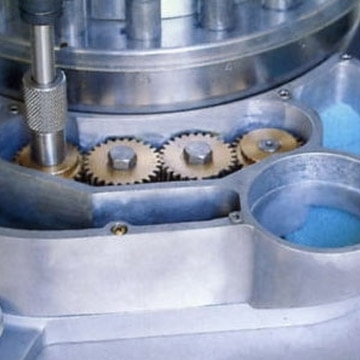 The scrapers seals for the upper punches protect tablets from oil drip, while the dust seals on the lowers prevent the punches from binding and reduce wear on the cam. 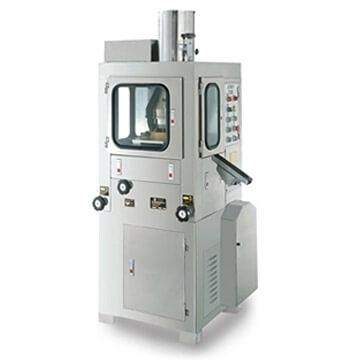 This combined with an efficient dust extraction system allows prolonged run with little downtime for cleaning. Direct rotation of the turret by the main shaft reduces the moise level; it provide maximum protection to the gears and the drive system. High pre-compression of 3000 kgs insures trouble-free processing of difficult granules. It helps in the direct compaction of materials, reducing lamination and capping. Pressure rollers are made of special tool steel that ensures uniform pressure application. The double bearings are fitted, which minimize wearing of the rollers. The feeder support platform is preset at the factory to the correct height and should not require adjustment. Quick release clamping screws allows removal of the feeder for cleaning and tool changeover without the need to disturb the feeder platform setting. The two chambers feeding system has been improved further. It is driven from top by a variable speed motor. The unit can be assembled or disassembled easily. The detachable panels can be removed easily, which reveal the entire bottom punch cams. This allows easy removal of the bottom punches. Upper punch monitoring device is available that would switch off the machine in the event of punch tightness. Type of tooling EU"D" IPT"D" EU"DB" EU"B" IPT"B" EU"BB" IPT"BB"